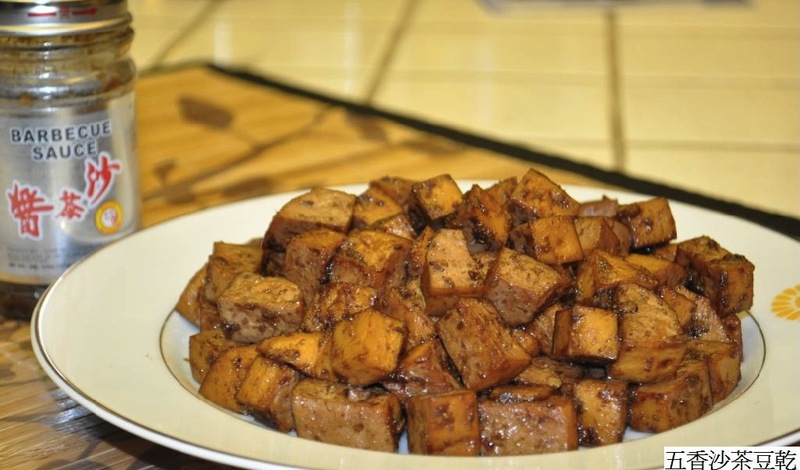 Vegetarians and meat-lovers alike may be surprised by this bean curd dish, which infuses plain baked tofu with barbecue flavor and Taiwanese spices. Bean curd is another name for tofu, which is made from pressed, curdled soy milk. Chinese tofu is more often referred to as bean curd, while silken tofu is softer and referred to as Japanese style tofu. Heat sesame oil in a wok over medium heat. Add garlic and ginger and sauté until fragrant. Turn the heat up to medium-high and add the bean curd cubes. Stir fry for about 3 minutes. Combine all of the seasonings and add to the pan. Continue to stir fry, turning the heat down to low and cooking until the sauce is fully absorbed. Serve the dish either hot or cold. What does plain baked tofu look like? If you prefer spicy food, you can add chili oil to the combination of seasonings. Please note that homemade spiced bean curd does not contain preservatives. Be sure to store it in the refrigerator.